I should start by saying that if anyone needs to freak out on this blog post, please do it here on WordPress and not on my syndicated statuses (I really don’t want a Facebook avalanche). I’m sure there will be some Big. Shock. on some of your parts by the contents herein. I visited my grandmother in Baltimore yesterday. I was in town in preparation for a trip out to the Left Coast today (I’m typing this on the plane next to two lovely new people I’ve just met. Tyler Durden would be so proud). It was the first I had seen Gramma since announcing my divorce to my family and close friends (if you’re just now learning this, sorry. You may be my close friend and I just forgot… Yes, I’m fine. No, I don’t want to publicly talk about it), and to say I was apprehensive to see her would be an understatement. I’ll admit it; I’d chickened out and hadn’t told her myself (I made my father do it…). My grandparents were married 49 years before my grandfather died, and having only been married 2.5 years, I’ll admit I was a bit embarrassed to admit to her that I had failed. Of course, being the good grandmother she is, she hollered at me for thinking she wouldn’t understand and told me I had her full support. But one of her questions did blindside me: Are you still going to be Jewish? Too much Passover for one hand. 2009. I suppose it’s a reasonable question on the surface. 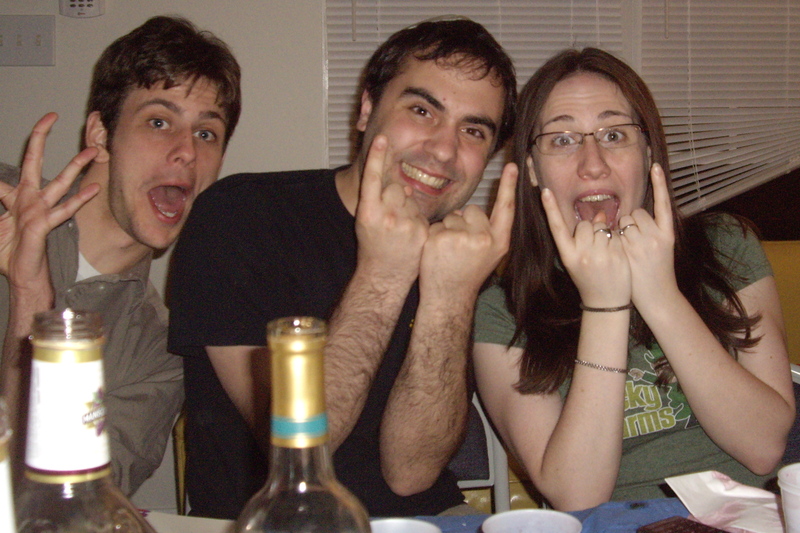 My partner and I converted together (along with my wonderful friend E.) about four months after we got engaged, so I could see how it would seem that I had converted because of him. But her question got me thinking: how many people in my life 1) think I’m Jewish because of my partner (and if this is a lot, how bad am I at communicating?) and 2) do not understand how conversion to Judaism works? These questions kept me up last night. Seriously. I’m an instructor of religion, after all, so what do I do with all this nervous mental energy? Start composing a blog post in my head at 3:30 in the morning (on my cousin’s couch, between superhero sheets, like a BOSS). The rabbi will not let you convert if they think you have been coerced in any way. Meaning, you cannot convert for someone. It must be your choice, and the choice must be made freely. Many people do convert when their intended spouse is Jewish, but in many Reform (and some Conservative) marriages, conversion isn’t necessary. For Orthodox couples, both partners must be Jewish. In any case, it still must be the choice of the convertee and not the partner. There is an education process associated with conversion, which gives you time to change your mind if necessary and to make sure you fully understand the new life you are choosing. This can vary in length depending on the denomination and the impetus behind conversion (I’ve heard it as few as six weeks in the event of an upcoming wedding and as long as 18 months). Part of your vows when you convert (in front of a beyt din) are to live a Jewish life and to raise any children you have as Jewish and to forsake all other previous religious vows. When you convert, it is not an individual experience. Three other Jews have to stand for you (the aforementioned beyt din). The ceremony is public. Your community becomes your family. You take on the entire history of the Jewish people as your history. The Holocaust, the pogroms, the Inquisition – all of these historical events happened to your people. Your rabbi makes absolutely sure you understand this. And what about my conversion? I will not go into the details of why I chose to convert, but I came to the decision separate from my partner. I had been contemplating this decision since high school but did not convert until October 2007, due to moving around and trying to find the right temple to take classes. Classes were monthly, taking place over the course of one year. In addition, I had to attend services weekly to make it through one entire festival cycle. Torahs are really heavy. I don’t recommend strapless dresses. 2007. When someone converts to Judaism, they take on a Hebrew name. This is the name one is called to the bema, or altar, with, to say prayers and to read from the Torah and other books. If born Jewish, your parents choose your Hebrew name, and you are “that name the son/daughter of their names” (so if I were to use my English names, I would be Holly the daughter of Michael and Cynthia. As a convert, I was given the parents Abraham and Sarah, the de facto parents of all converts. I chose the name Devorah after my Aunt Debbie, who has always been incredibly supportive of all of my school, religious, and life goals. Now that I am changing my name back to my maiden name, I had considered taking Devorah as my middle name, or second middle name, but it doesn’t quite work with Holly Jordan. And Dr. Holly A. Jordan just looks smashing on a door. Being Jewish with my partner, who converted in the same class with me (again, because he was already on that path and not because of me), was a blessing. Knowing that I would raise Jewish children in a Jewish home was an important part of my relationship. I will not say that relationships cannot work out with different religious traditions (all my Cashews prove otherwise, and I’ve got some Jain-Hindu and Muslim-Jewish friends, too), but having that support, and having a Jewish wedding and life, was always important to me. But no, my new life doesn’t mean an end to my Jewish identity. My Jewishness is my self, not my relationship self. I think I’ve been Jewish since my father brought me home my first menorah from a yard sale (or since I realized that Old Testament/Hebrew Bible stories are WAY more fun [and less redundant] than New Testament stories). 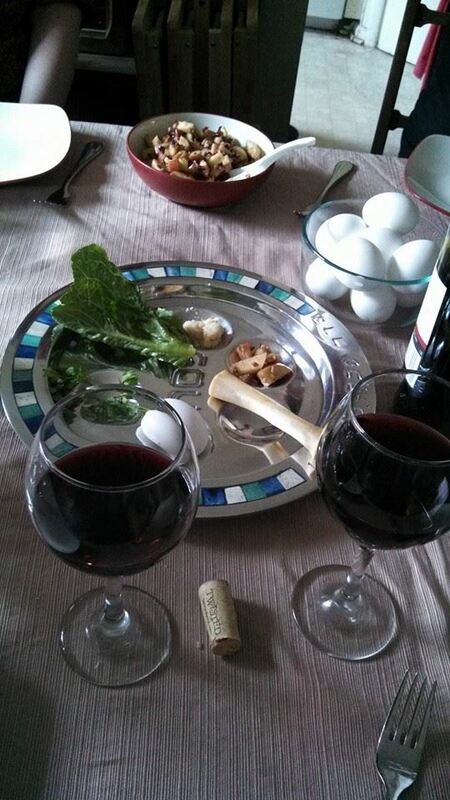 If nothing else, the tumultuous events of the last several weeks have led to a rededication to my Jewish life. My first Friday alone in my apartment, I took down my candlesticks and kiddush cup for the first time since I moved to Blacksburg and welcomed in Shabbat (with my sad little Stouffers veggie lasagna and bottle glass of wine) with my dog. 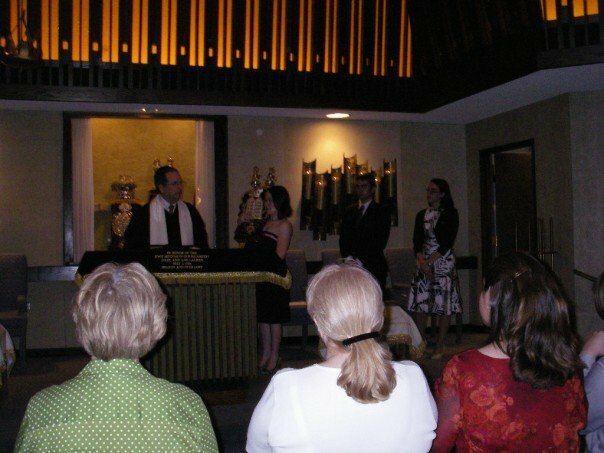 I felt more in touch with my Judaism than I had since my wedding. So will I still be Jewish? Yes. Could I convert back or to something else? Absolutely. I have that ability as a human being. But the process of conversion ensures that it is a decision that you do in fact want. I am Jewish. Nothing will change that. “Hannah Arendt” – Why Now? Okay, so here’s the transcript of my talk from last night. I ad-libbed some stuff about questions from yesterday’s blog post. I plan to rewrite it for publication, so any thoughts/suggestions/haikus would be appreciated. Thank you, and thank you to everyone who worked together to put on this event: ASPECT, Religion and Culture, Political Science, and the professors here. Rather than try to do a critique of the film as a whole and somehow fit it all into the body of Arendt’s work, I instead decided to bring out four key points from the film that stood out to me (which actually might be doable in ten minutes): Arendt’s own Judaism, the status of Arab Jews, the position of the bureaucrat, and the funding for the film itself. Arendt was Jewish, but culturally so. She was a secular Jew, and her home showed it. There are none of the tchotchkes associated with Judaism on the shelves, no mezuzah on the door. Even in Jerusalem, she maintains her Western appearance and does not dress as traditionally as the other women she interacts with. Revisionism to make Arendt seem more “Jewish” may have done something for her character in the film, but the film pulled no punches, showing her as others perceived her and keeping her in this motif. Along with that attention to historical accuracy, Arendt’s personal beliefs on types of Jews shows up obliquely in the film. Arendt is known for believing that German Judaism was the best Judaism, remarking that it was lucky for Eichmann to have three German Jewish judges in Israel, who she called the “best of German Jewry.” She stated to Karl Jaspers once that the Israeli police force “gives me the creeps, speaks only Hebrew, and looks Arabic.” (xvii). This, in comparison to her championing the rights of Arab Palestinians seems strange. It is remarked upon in the film that she never quite forgave Germany for letting her down as a German, yet she is inseparable from Germany in culture. The film portrays this subtly; while she passes Arab Jews and Eastern European Jews in the streets of Jerusalem, she does not interact with them. All of her Jewish friends are German Jews and she argues with them from the point of view of German continental philosophy. The film did an excellent job keeping this reality in place, in spite of the fact that it makes Arendt look less than favorable to non-German Jews. The status of the bureaucrat comes up often in the film, as in Arendt’s work, and has definite applicability to discussions of the modern Israeli state. Part of Arendt’s arguments for the banality of evil are the bureaucratic persona of figures like Eichmann—dedicated pencil-pushers who just followed orders. I’ll go out on a limb of controversiality here and say that these arguments are fascinating when one considers some of the more contentious policies of the Israeli government with regard to border control and settlements in the West Bank. Many of these policies, which Arendt herself cautioned against, could be seen as being able to be perpetuated by a banality within the bureaucracy of Israel. Groups like J Street represent American Jews against the policies of occupation in the West Bank and Gaza, and there are many op-ed writers within Israel who speak out often against Israeli treatment of Palestinians, yet these policies continue. When Arendt criticizes Israel’s right to even try Eichmann, her colleague Kurt Blumenfeld responds, “Be a little patient with us,” implying that Israel is a new state bound to make some mistakes. But how long is too long to remain being patient? At what point does “Be a little patient with us” become a crutch for not having to take a closer look at divisive policies? If nothing else, this film spurs the audience toward reevaluating the current state of affairs in Israel through Arendt’s lens. I’d like to conclude with the funding and the making of the film. According to Heinrich Blücher, “History more than one man” was on trial during the Eichmann trial. It is with this point of view on history rather than individual that I do wonder why make this film? Why now? Two Jewish film funds, the Israel Film Fund (a 501c3 nonprofit) and The Jerusalem Film and Television Fund (under the auspices of the Jerusalem Development Authority, a joint venture between the Israeli Government and the Jerusalem Municipality), partially sponsored the film. But why? Why now? Was it to redeem Arendt’s reputation amongst a new generation of Jews? Or was it to teach a new generation why Arendt’s views were dangerous to the Israeli state? I was left unclear by the film itself. While the audience is naturally pulled toward supporting Arendt, both through Barbara Sukowa’s stunning performance and the weight of Arendt’s words herself, the negative responses to her work in the film far outweigh the positives. Arendt’s rousing defense of her work before the students and faculty of the New School at the end of the film leaves the audience thinking the film will have a positive dénouement, yet the mood is ruined by her dear friend and colleague Hans Jonas not being convinced and disowning her. The film ends as it began, Arendt alone in her apartment, listlessly smoking a cigarette, isolated with her thoughts. Characters in the film talk about how Arendt is asking questions about things best laid to rest, but why? Simply because the questions make us uncomfortable? And what does it say that Israel funded a film that reopens all these questions? The good news is, we are asking these questions. By having a panel such as this, we’re trying to find out how Arendt’s work is still valuable today, and I would definitely argue that it is, indeed, valuable. Hannah Arendt, Eichmann in Jerusalem: A Report on the Banality of Evil (New York: Penguin Books, 2006), xviii. Eichmann in Jerusalem: A Report on the Banality of Evil (New York: Penguin Books, 2006), xvii. Eichmann in Jerusalem: A Report on the Banality of Evil, 13. Tonight, along with several of my ASPECT colleagues, I will be presenting on the 2013 film Hannah Arendt at VT and will have something much more coherent and scholarly to say by then. But the film kept me up for most of the night, and I just need to say a few things. The film itself is visually and emotionally stunning. Arendt shines through as the antihero, spurned by most of her closest friends, but sure of her views. Her beliefs are well-represented, and at times, the script is a direct quotation from Eichmann in Jerusalem. The Heidegger bits of her life are tastefully done and not as salaciously presented as in other accounts. The viewer is left devastated by Arendt’s naivete regarding her work and how it would be received. This naivete, I think, is what kept me up so much last night. I work a lot with the writings of Arendt, Butler, and other Jews on the fringes of the Zionism/Israel/Palestine debate. I try to be as objective in my analysis as possible when discussing these issues, but the problem becomes that it becomes absolutely impossible to enter into debate with those who do not separate their religion from their politics (and how can you as a Jew talking about Israel?). As seen through the film, most of Arendt’s friends who disowned her hadn’t even read her pieces in The New Yorker. They were going off hearsay and quotes out of context. Barbara Sukowa’s performance is stunning, and you can feel the despair that Arendt felt through the closing act of the film. I had a conversation with a colleague just yesterday about my dissertation. Its current title is purposely provocative (Mama needs a book deal, y’all). He pointed out that it’s a great title if I never want a job. I retorted that if someone didn’t want to hire me because of my research, I probably wouldn’t want to work for them. Probably a stupid point of view in the current academic hiring environment. But on some level, I do believe in what I said. It would be impossible to be a part of a department that didn’t at least respect my research. Judaism has always been a religion that revolved around asking questions. Questions are the basis of the entire Talmud. Abraham, Moses, even Job (though G-d really does get a bit snarky with him…) question G-d. Elie Wiesel’s The Trial of God puts G-d on trial (and G-d is found guilty) for the crimes of the pogroms. To question faith, G-d, and even Jews is part of the rhetorical tradition of my chosen faith. So the viciousness of the response to Arendt’s work was painful, absolutely painful to watch. Arendt even admitted later in life that she could have worded things better/more clearly in Eichmann, that she could have been less sarcastic. As a sarcastic person myself, I completely understand hiding behind words to distance myself from tough topics. Arendt was not antisemitic. Like many European Jews of her time, she was, unfortunately, orientalist in many of her views of non-Western Jews, and for that, I am disappointed. But her portrayal of Eichmann in many ways is spot on and deserves respectful discussion, even if you disagree. I have been called antisemitic by those who disagree with my research on numerous occasions, and given I am a practicing Jews, these slurs are so hurtful. As Butler states in Parting Ways, to be critical of any of the State of Israel’s policies has been turned into being an antisemite. Leave off the table any discussion of Israel’s legitimacy, right to exist, etc., because frankly I don’t care (Israel is there, and we can’t change that. Deal with reality, people). Any government can be criticized for its failure to live up to its own stated goals. I find it interesting that while her work was eventually banned in Israel for a period, initially the backlash against Eichmann was far worse in the US than it was in Israel (Haaretz was actually quite kind, at first). It’s not all that surprising, though. Many of the most vocal supporters of Israel tend to be from outside Israel in the Diaspora. Here’s where I’ll probably get lambasted like Arendt herself. Israel is a Jewish state. Questioning everything is a Jewish tradition. To ask questions is not to demonize. No one has a problem with questioning the US government over its actions. Israel should be no different. Israel, as a relatively new state, should not want to be different in this way. I loved this film, but it terrified me. What if I pour all of this time and love and energy into a dissertation (and hopefully book) that explicitly states what I want it to, yet is dismissed because people assume its content rather than actually reading it? What if it ruins my career before it even starts? If we ask questions, but no one actually reads the questions, what’s the point? The point is that we must ask questions, of Israel, of Palestine, of any and all governments in this world community of ours. We must question our leaders, our public thinkers, hell, even each other. Even if the questions anger us, enrage us, make us have to think about things we don’t want to think about. These half-baked ideas brought to you by a complete lack of sleep. My actual talk for tonight will be posted tomorrow.